Gaëlle Béquet holds a Master in Library science from Ecole Nationale Supérieure des Sciences de l’Information et des Bibliothèques (Lyon, France) and a PhD in Information and Communication Science from Sorbonne University (Paris, France). She started her career as an IT consulting specialist for public libraries with the French Ministry of Culture and Communication. She has also managed various academic libraries and worked as international officer. In 2014, she was appointed Director of the ISSN International Centre. Clément Oury is Head of Data, Network and Standards at the ISSN International Centre. This service is in charge of the coordination of the bibliographic activities of the 89 ISSN national centres and of the assignment of ISSNs for countries without national centres. He is also a member of the standing committee of the IFLA cataloguing section, chair of the IFLA PRESSoo Review Group, and chair of the ISSN review group. He was formerly Head of digital legal deposit at the National library of France and Treasurer of the International Internet Preservation Consortium (IIPC). He holds a PhD in early modern history from the University of Paris-Sorbonne. The ISSN Register provides authoritative information about serials and other continuing resources worldwide, thanks to the input provided by the 89 National Centres belonging to the ISSN Network. The ISSN Register, maintained by the ISSN International Centre, stores metadata, e.g. resource identifiers and links between resources, whose key role has been emphasized by the emergence of linked data. Access to ISSN Register information is provided by the ISSN Portal. The former portal was designed in 2004 and its search options did not allow users to discover and reuse data easily. Moreover, information was only available to ISSN customers. Since October 2016 the ISSN International Centre has been working on the implementation of a new portal, which started operating in January 2018. This new portal gives access to a sub-part of the data elements of the ISSN Register as linked open data. It also offers enriched and linked information to its subscribers, who benefit from enhanced services like the automation of data ingestion. Features such as data search and display and retrieval have also been greatly improved. Via interactions with other data repositories, the ISSN Register reuses additional information to foster information discoverability in the new ISSN Portal. The ISSN International Centre1 is the co-ordination node of a network comprising 89 ISSN National Centres specialized in the identification and description of serials and continuing resources. The ISSN International Centre is also an intergovernmental organization under the aegis of UNESCO and the French government, and the Registration Authority appointed by the International Organization for Standardization (ISO) to manage ISO standard 3297 – International Standard Serial Number (ISSN). The main purpose of the ISSN International Centre is to develop and maintain the ISSN International Register2 which contains descriptive data about two million print and digital journals, magazines, newspapers, book collections and websites, i.e. resources that are issued over time with no predetermined conclusion. Information provided by ISSN National Centres and compiled by the ISSN International Centre feeds the ISSN Register, which is the worldwide reference database for serials. Libraries, publishers, system vendors, abstracting and indexing services and many others use ISSN data on a daily basis to check and update their own data. Since 2004, ISSN data have been available on the web via the ISSN Portal. By 2014, ten years after its implementation, the portal was felt to be outdated and to lack good search functionalities. The Governing Board of the ISSN International Centre commissioned a study that was carried out by CIBER Research, a UK-based consultancy. CIBER Research submitted a series of recommendations which were approved by the Governors and by the General Assembly of member countries in 2016. As a result, the strategy of the ISSN International Centre now includes a specific action which aims at sharing ISSN information with a wider community by giving free access to a core subset of ISSN data and by providing access to full ISSN data and services on a subscription basis. The ISSN International Centre is currently implementing a ‘freemium’ model for the publication of ISSN data. The strategy also includes the introduction of a fee for ISSN assignments to continuing resources that are published in countries without an ISSN National Centre, i.e. those published in countries that are not members of the ISSN Network and those published by international organizations. The recommendations voted by the ISSN governance bodies in 2016 provided a detailed roadmap which the ISSN International Centre has been following since then. Our first goal is to expose a subset of the ISSN Register as linked open data to foster its reuse by third parties. Our second goal is to enhance ISSN information, notably by adding consistent subject metadata and by providing graphs to visualize links between related publications, i.e. continuations, title splits and title mergers. Our third goal is to provide a better user experience for publishers requesting ISSN assignments directly from the ISSN International Centre. This paper focuses on the new ISSN Portal, even though this portal is only a part of the new ISSN services. Readers will not find herein a detailed description of the portal’s various functionalities, but rather some highlights on specific features which support the ISSN International Centre strategy regarding the distribution of information, the inclusion in the linked data ecosystem, and the provision of expert services for the serial community at large. The team at the ISSN International Centre had never worked with agile methods on previous IT projects. In June 2016 a one-day bespoke training session was delivered on our premises by the French company, SOAT. In addition to this, an expert product owner worked with the ISSN team for a month to produce a specification for all the user stories and a breakdown of the requirements for the ISSN Portal and the ISSN customer extranet, and then to assign them different levels of priority. The ISSN International Centre then launched its call for tender in October 2016, and the French IT company, Progilone, won the bid. Two product owners were appointed within the ISSN team and one project manager was appointed by Progilone. The portal and the customer extranet were developed using agile methods based on sprint reviews occurring every three weeks between the product owners at the ISSN International Centre and the project manager at Progilone. Meetings of the steering committee were organized on a quarterly basis. The initial project timeline anticipated that a minimum viable product (MVP) would be delivered in March 2017, with the final product appearing in August 2017. A product demo based on the MVP was in fact organized for the meeting of the Governing Board in April 2017. In June 2017 an amendment to the original agreement set a new timeline with all functionalities to be developed by the end of 2017. As of December 2017, key user stories have been implemented and a few more will be added during the first quarter of 2018. Even though the requirements of the two applications (portal and extranet) and the needs of the three main types of users (portal users, corporate customers, and publishers) were different and clearly distinguished, it was decided to address them through a single development project. This decision was taken in order to create synergies, to foster the interactions between both applications, and to achieve cost-effectiveness by mutualizing developments. For example, registered publishers may check the outcome of their assignment requests through the extranet; when the request is processed and the record is produced, they are able to smoothly access its bibliographic information from the ISSN Portal. Conversely, from the portal, they are entitled to request a record modification, the outcome of which they will follow in the extranet. The second critical choice in terms of development was to rely on open source software elements: the developments performed by Progilone should essentially consist of customization of existing tools. Drupal5 was used as the main piece of software for all interactions between humans and ISSN database: the graphical user interfaces of the portal and the extranet are based on it. This is where most adjustments were made. The Elasticsearch6 search engine stores and provides bibliographic data, as the production database of the ISSN Register itself is not directly requested any more by external users or applications. Finally, Jena7 was chosen to manage the triplestore where ISSN information could be exported, stored and queried as linked data. The new portal now offers all tools and services to search, discover, visualize and retrieve ISSN data describing serials and other continuing resources. The portal offers to any user – human or machine – free access to ISSN ‘essential’ identification metadata, allowing the distribution of ISSN information as linked open data. It also provides ISSN subscribers with a completely new range of data and services through the enrichment of ISSN records with information from external sources and/or data computed by the ISSN International Centre. In order to accommodate the range of different situations and contexts in which the data are accessed, specific user profiles were defined. These specify which kind of data a user can have access to, which data are available to this user, and which tools are provided. Free users are non-registered users accessing the portal on the web. They can search ISSN data from ‘confirmed’ records, i.e. the records describing published resources, which are edited by the ISSN Network. On the free portal, data elements displayed for each publication are deemed ‘essential identification information’, i.e. the metadata required to unambiguously identify a resource. This freely available data includes the identifiers assigned by the ISSN Network (ISSN, ISSN-L, cancelled ISSN if any), the key title and the title proper,8 the country of publication, the medium and a URL (if any).9 Administrative metadata, such as the name of the ISSN National Centre responsible for the record and the latest date of modification, are also provided. However, free users will still have access to complete ISSN data for specific records. ROAD,10 the Directory of Open Access Scholarly Resources, is a stand-alone website developed by the ISSN International Centre with the support of the Communication and Information Sector of UNESCO. ROAD provides identification and description data about more than 23,000 open access publications, including journals, conference proceedings, monographic series, academic repositories and blogs. ROAD will eventually become a part of the new ISSN Portal and its data will still be available for free. ‘Corporate’ users are subscribers, whether individuals or institutions. They can access the whole ISSN data set, including provisional records describing resources not yet published but whose publisher already requested an ISSN assignment. Corporate users can benefit from the extended set of services described below. Finally, a specific profile has been designed for the professionals working at ISSN National Centres, who can access additional data (essentially information related to the general management of the ISSN Register) and use functionalities related to their responsibilities within the ISSN System. The original ISSN Portal was simply a bibliographic database – with accurate information but limited search and discovery features. It was, in fact, never intended for a wide audience as its access was restricted to registered users. The new portal embodies a radically different approach: its primary vocation is the distribution of information, with a large array of services. As mentioned above, its design is based on the identification of specific user profiles, with services and tools offered to each user tailored to meet their specific needs. Users who are not familiar with bibliographic data are provided with a simple search (on all fields of the resource, as shown in Figure 1). They can also refine the results of their search through facets before accessing the records. Alternatively, they may use a cartographic search in order to identify resources published in a specific country (for free access) or a specific city (for subscribers). The display of the record itself has been improved: it clearly makes a distinction between the data elements related to the publication itself (title, frequency), those related to the record (date of creation, responsible ISSN Centre), and those describing the relationships between continuing resources (continuations, merges, splits). 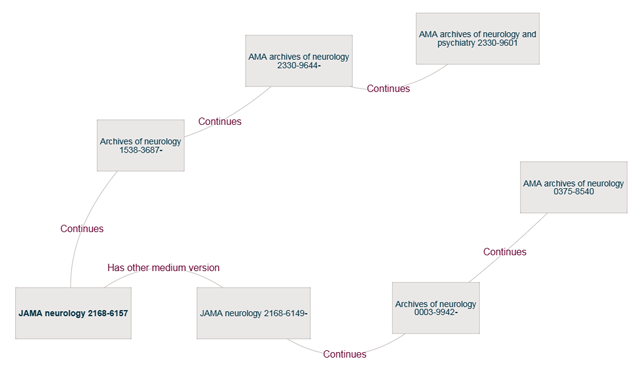 Graphical representations of these links are also provided so that users can navigate between records (see Figure 2). The identifiers themselves (especially ISSN and ISSN-L) are highlighted in a specific section, as well as the links directing users to external online resources. ISSN records are also enriched with information provided by a wide range of partners. It is possible, for example, to identify what resource is referenced in the DOAJ or in Scopus, what its impact factor is, and whether its issuing body has an ISNI.11 Further data enrichments are currently under way. An ‘ISSN-L display’ of the record is also available. This display generates a ‘virtual record’, which aggregates information about the records linked together with an ISSN-L. This ISSN-L display therefore provides information about a resource, whatever the medium. Advanced users spotting errors or outdated information in ISSN data can report this to the National Centre responsible for the record. They are requested to provide supporting evidence (a scan of a title page, a URL) with their request. This is then monitored by the ISSN International Centre and the users are informed of its outcome. The ISSN Portal is a truly innovative tool because it is built to foster exchanges of metadata. Individual users can retrieve data from a record or a set of records that they can select. Several formats are available: MARC formats (MARC21 and UNIMARC, as ISO 2709 or XML) and linked data formats, i.e. RDF/XML, TTL, JSON. A CSV export is still possible. any request sent to the portal can be automated thanks to the use of REST protocol; the download of results is also automated. This feature is restricted to subscribers. Note that already existing machine-to-machine services, such as OAI-PMH or Z39.50, are still offered. The complete ISSN Register is exported as linked data on a daily basis and stored in the RDF triplestore, i.e. a database storing information as triples. In order to map bibliographic information from the ISSN Register into linked data, an ISSN data model and an ISSN application profile have been designed.13 The data model is intended to be consistent with the overarching models developed by the bibliographic community (especially the IFLA Library Reference Model),14 while taking into account the specific qualities of continuing resources – especially their dynamic and event-oriented nature. The ISSN application profile implementing this data model is based on popular and simple ontologies (mainly Schema.org15 and Dublin Core16) for the most common metadata and on more specific ones (Bibframe17 and Marc21rdf.info) when it comes to detailed bibliographic information. This data model supports the release of all ISSN information, including data provenance, as well as the distribution of ‘essential’ information as linked open data. This model is flexible and extensible enough to be enriched by additional information upon which new services will be built. In the ISSN RDF triplestore, information is enriched by data from external sources, such as publishers’ websites, the online catalogues of national libraries and the digital libraries of international organizations, indexing, abstracting and evaluation online services, and more generally any organization publishing information related to continuing resources as linked open data. The ISSN triplestore can be queried via a SPARQL end-point, which is used by the ISSN International Centre, the National Centres and customers with specific needs. 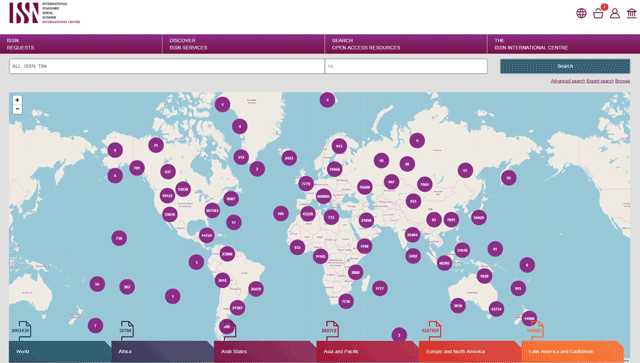 The new ISSN Portal and extranet became operational from January 2018. The portal is a great showcase for the international co-operation between the diverse bibliographic agencies within the ISSN Network. These ISSN agencies have been carrying out the identification and the description of print and online continuing resources for more than 40 years. The expertise of the ISSN Network, its capacity to innovate and to work closely with publishers and libraries and its commitment to convey accurate information to a variety of users are now made more visible with ISSN data available for reuse and wider dissemination. The relationships between the ISSN International Centre and ISSN users have been completely redesigned to allow for greater interaction. Publishers requesting ISSN from the ISSN International Centre will have their own specific accounts on the extranet. They will be able to track the ISSN assignment process, upload documentary evidence and initiate a dialogue with the team at the ISSN International Centre if necessary. Publishers will be able to retrieve complete data for their own publications and claim titles they become responsible for. On the ISSN Portal, it will be possible for registered users to contribute to the updating of ISSN data by submitting amendments to the validation of the ISSN Network. They will in turn benefit from the large range of features to search, retrieve and download information. The ISSN adventure is just only beginning. There is still work to be done to add more features on the portal, such as alerting services. Throughout 2018 the ISSN International Centre will be busy promoting its enhanced offer at fairs and professional conferences. The feedback provided by our community will help us design innovative services built upon the technical potential of linked data. ISSN International Centre website: http://www.issn.org (accessed 5 February 2018). ISSN International Register: https://portal.issn.org (accessed 5 February 2018). These publishers operate in countries without a National Centre. Publications by international organizations are also managed by the ISSN International Centre, as well as those from some multinational publishers, by special agreement between them and the ISSN International Centre. A ‘Publisher’ is defined as any person or organization in charge of a continuing resource, or acting on behalf of the actual publisher. The extranet is also designed for third parties requesting the assignment of ISSN to a resource in the framework of specific projects (i.e. a retrospective digitization project). Namely, Arabic, Chinese, English, French, Russian and Spanish. Drupal website: https://www.drupal.org/ (accessed 5 January 2018). Elasticsearch website: https://www.elastic.co/fr/ (accessed 5 January 2018). Apache Jena website: https://jena.apache.org/ (accessed 5 January 2018). The ‘title proper’ is the title as it appears on the preferred source of information for the resource. The ‘key title’ is a standardized and unique form of title derived from the title proper. Whenever necessary, uniqueness of the key title is ensured by the addition of a qualifier to the title proper. Note that variant titles or abbreviated key titles, which are not indispensable for resource identification, are not open to free users. On the notion of essential identification information, see Oury C, ‘ISSN: Transitioning to linked data’, paper presented at IFLA WLIC 2016: http://library.ifla.org/1959/ (accessed 5 January 2018). ROAD website: http://road.issn.org (accessed 5 January 2018). The International Standard Name Identifier (ISNI) is the ISO-certified global standard number for identifying the contributors to creative works and those active in their distribution, including researchers, publishers or aggregators. See: http://www.isni.org/ (accessed 5 January 2018). UDC website: http://www.udcsummary.info/php/index.php (accessed 5 January 2018). ISSN linked data application profile: http://www.issn.org/understanding-the-issn/assignment-rules/issn-linked-data-application-profile/ (accessed 5 January 2018). The IFLA LRM is a high-level conceptual reference model developed within an entity-relationship modelling framework. It is the consolidation of the separately developed IFLA conceptual models: FRBR, FRAD, FRSAD. See the IFLA website: https://www.ifla.org/publications/node/11412 (accessed 5 January 2018). Schema.org website: http://schema.org/ (accessed 5 January 2018). Dublin Core website (Dublin Core Metadata Initiative): http://www.dublincore.org/ (accessed 5 January 2018). Library of Congress website (Bibliographic Framework Initiative): https://www.loc.gov/bibframe/ (accessed 5 January 2018).